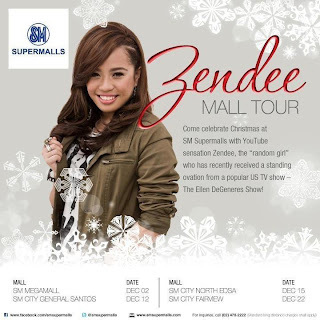 The fans are surely excited to the upcoming Mall Tours of Zendee Rose J. Tenerefe at SM City North Edsa tomorrow back-to-back with next Mall Tour this next Saturday on December 22, 2012. On the lighter side notes, I'll be getting on the 3rd and 4th Mall Tour back-to-back. So, to all shoppers who are going to SM City North Edsa tomorrow, see you there! Also, shoppers of SM City Fairview, see you on the last mall tour as we are going to get a glimpse of back-to-back events on December 22, 2012 because aside from the Mall Tour with Zendee, there will be a glam fireworks display which will happen after Zendee's Mall Tour. "CHRISTMAS ISN'T CHRISTMAS WITHOUT MAKING THINGS MERRY AT SM CITY FAIRVIEW and SM CITY NORTH EDSA"
See you there! Mall hours extended for 2 more hours today and tomorrow and on December 21 and 22 from 10am til 12mn.